Made It Through Mum: When it comes to your heart... choose the best! Our heart is the center of our cardiovascular system. It is responsible for pumping blood through our body, carrying nutrients in and taking waste out. Having good cardiovascular health is an important factor of optimal wellness. Sadly, many people do not pay enough attention to their cardiovascular system. When your heart and/or other parts of your cardiovascular system, such as your blood vessels, are not properly cared for, they will fail to function properly, which may lead to certain health issues. 3. Drink plenty of fresh, pure water everyday. 4. Optimize your Vitamin D level through appropriate sun exposure. 6. Avoid smoking and drinking alcohol excessively. 7. Focus on eating a diet of whole, unprocessed food from healthy,sustainable sources. 8. Get enough high-quality animal -based omega-3 fats, such as Puritan's Pride Double Strength Omega-3 Fish Oil. Double Strength is good for the heart. It supports healthy cholesterol levels, plays a role in supporting cellular health and supports healthy joints. Puritan's Pride ® Premium supplements are produced from the finest raw materials under stringent quality control standards. The state-of-the-art manufacturing and packaging facilities insure you the highest quality nutritional supplements money can buy. When it comes to your heart...choose the best! Make that heart- healthy choice now! 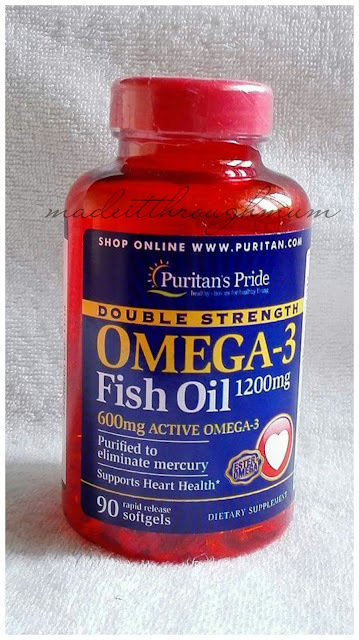 Grab a bottle of Puritan's Pride Fish Oil Omega-3 Double Strength 1200mg 90 softgels at a discounted price in Lazada. Click here .